The best regulation of guns is not through government force and coercion, but through education and knowledge. 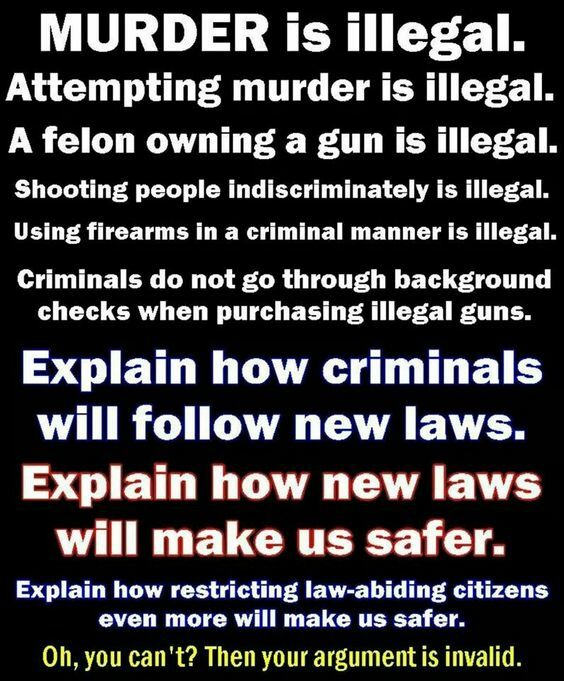 Anyone who owns a weapon and does not immediately start shooting people knows this to be true..
Each of us has a natural right to defend his person, his liberty, and his property. These are the three basic requirements of life. Limiting our ability to defend these aspects by regulating the tools to do so puts all of us at risk. I'm a gun lover, that is 100% pro-regulation of firearms. He doesn't even have the guts to take existing guns away from owners. Get a gestapo to go house to house and take them by force. I know. He just acts like like we should trust him and he is all puppy tails and unicorns. Dude couldn't even beat Cruz and the media's legs are trembling. No one in the press will ask him tough questions about this. So, everyone on here that's pro-2nd is a part of the national guard? If not, the "well regulated militia" argument doesn't hold water. Not to mention that it's a part of the government, which is exactly what you're arguing the militia in question is designed to help overthrow if the need arises. I truly don't understand that argument. It isn't a "gotcha" thing. Actually have a conversation with us instead of constant memes and "ask your state". Actually talk with us. It would be interesting to hear your own, true thoughts on the matter. See my last post above. You are flailing and deflecting again using incorrect interpretations of words. That post wasn't directed at you. It was directed at something neo said. You've yet to respond to the questions I directly asked you though...? Why use a SCOTUS case in your argument that directly contradicts the main argument of ATS 2nd proponents? I did answer your direct question. But, since it doesn't agree with your dogma, you've disregarded it outright. I do not have to repeat myself for those that fail to grasp simple concepts because they are blinded by a narrative. First of all, what's my dogma? I'd be interested to know. Second, I've disregarded nothing. I've said that the militia argument doesn't matter, because individuals have rights to own weapons as well. Now, stop deflecting, and please answer this question directly: The SCOTUS case that you referenced, D.C. vs. Heller, SPECIFICALLY says that guns and gun ownership IS NOT UNLIMITED, and the government will continue to regulate firearms. The SCOTUS said that. What is your response to what they said? Is that constitutional? Again you are picking and choosing the rulings in that case....aren't you? That case was NOT just a ruling regarding the limitations of firearms. It ruled that the PEOPLE had the right, regardless of whether they are in a militia or not. Now, I've stated that twice....please try to grasp that concept...as I will not say it a 3rd time to satisfy your willing ignorance. Come on Krakatoa, be honest with yourself, you QUOTED me agreeing with that part of the ruling for crying out loud! The SCOTUS ruled that individuals have the right to have firearms. 100%, I agree. It's incredibly frustrating to have you keep repeating something that I've already addressed multiple times, acting like I'm skipping over it because I don't agree. That's patently, 100% false. I am 100% in agreement with the SCOTUS that individuals have the right to own firearms. Now it's your turn. Address the point I've brought up that you keep skipping over by falsely accusing me of ignoring something I've already commented on in at least 3 other comments. For what it's worth, I own 7 guns, including an AR-15. So I'm not sure what you think my dogma is. I'm a gun lover, that is 100% pro-regulation of firearms. Now that that's out of the way, please answer the question I've posed to you, as I've answered yours a couple times now. OK, I misunderstood your follow ups, which is why I thought I answered it already. So mote it be. As for the related ruling on limitations, I personally do not agree with that aspect of the ruling. I think it is unconstitutional, and should be challenged with reference to the full context of the 2nd Amendment, as written. Especially focused upon the correction of the interpretation of the words "regulated" and "infringed". Using modern interpretations of those words with regard to the 2nd Amendment is disingenuous at best, and outright wrong at worst. Aiding or abetting the use of laws to limit or otherwise slow the exercising of the 2nd Amendment are unconstitutional on their face. Now that that's out of the way, here's my actual, completely sincere question: Should there be a limit somewhere in terms of what firearm a citizen can own? "Nothing drives up gun sales like a Democrat threatening to strip away your rights." what about when republicans draft and pass laws restricting or confiscating firearms? does that drive up gun sales too? Kind of sad...So instead of going after the 2nd how about something like the Patriots Act..
That's what I was saying earlier. The crime that Reuters helped Beto hide, is now added to his stack of evidence. No way Beto should be able to continue representing any part of the Democratic party, going forward.